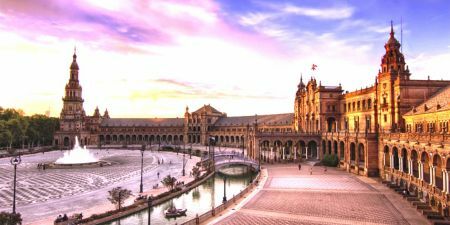 Enjoy this Morocco vacation visiting cities such as Marrakech, Casablanca, Rabat, Meknes, Volubilis, Fez, Chefchaouen, and Tangier in this Morocco 9 day itinerary. Explore The Diversity of religious sites , of culture and population , The History and the wormeth of Hospitality and richness of Atmosphere. Book Now! Transportation: Private air-conditioned vehicle with English speaking licensed driver. Upon your arrival to Marrakech you will be met by your English speaking driver outside the airport. 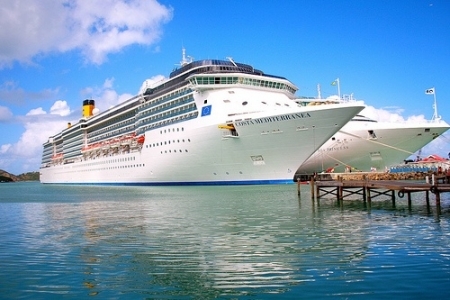 You will then be transferred to your hotel to check in and rest. Today you will get the chance to wake up and live Marrakech, a dream of many, so be sure to make the best of it. After your breakfast our local guide and driver guide will be waiting for you to start a guided city tour of the “Ochre City”. We will visit first in the morning the Majorelle Garden which was named after the French painter, Jacques Majorelle who dedicated a lot of effort and passion to this art piece. After Majorelle let’s continue after it to Menara and though the name in Arabic translates to “lighthouse”, it is actually a pavilion with a basin and a garden of orchards and olive groves. We will be heading afterwards to the Koutobia Mosque and through the Jewish quarter called Mallah. After lunch at a local restaurant, finish your visit with a carriage ride or “Koutchi” to Jamaa El Fnaa. Activities: Majorelle Gardens, Menara Gardens( interior visit optional ), Koutobia, Bahia Palace, Jamaa El Fna Square. Enjoy a lovely breakfast at your hotel before heading to the Moroccan Atlantic Coast, exactly to Casablanca. Upon your arrival check in and rest. 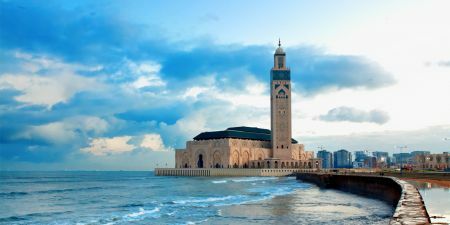 The evening is scheduled for a visit to Hassan II Mosque and a tour of the Habus and the local Souk. The more you know: If you are a fun of the Movie “ Casablanca “ then don’t miss on the famous Rick’s café from found on Boulevard Sour Jdid. After breakfast meet you driver guide to get transferred to Fez. En route, we will be making a MUST stop by Volubilis and Meknes. The archeological site of Volubilis is listed by the UNESCO as a worldwide heritage, and it is a witness of multi-cultural Morocco. A specialized guide will walk you around the remains of the Roman outpost, through the arcs of Triumphal arches, the Capitoline Temple and large captivating Orpheus mosaics which tells tales of roman life. Afterwards, the trip will continue to the Imperial City of Meknes, one of Morocco’s lesser-visited. It was built by Moulay Ismail and was conceived to be the ‘Versailles of Morocco’. Once you meet your local guide, you’ll be able to visit the famed gate of Bab El Mansour, and Lhri. These sites are the main beating veins of the city. We will then continue our way to Fez. Wake up today in one of the most ancient cities in Morocco. Founded in AD 808 by the Sultan Moulay Idris II, the city’s history and position is well Ingrained in the upcoming of the Moroccan Identity and traditions. It was once the Mecca of Science and Knowledge for it had the first University in the world, Al Karaouyine, and it wielded many scholars and intellectuals. It had fertilized the minds and the souls of many over the age, and surely more to come. Its solid and well established position over centuries as a cultural melting pot had provided it with a unique spirit of multi-culturality, tolerance and peace. Therefore, Open up to the city and enjoy what it has to offer. Along with your tour guide, touch on the cities marking features and uniqueness which you cannot find anywhere else. As you walk in to Fez El Bali ( the ancient town) you are faced with a fork in the road , the right one is “talaa kebira “ and the left one is “talaa sghira” and unlike Robert Frost we will travel the road most taken as we follow the footsteps of great women and men who been here . The “Talaa Kbbira” will lead us straight to Bou Inannia Madrassa at the end of the market. This Madrasa served as theological colleges and was built in 1351 with a Merenid Style. Right in front of Bou Inannia lays one of Fez’s mysteries, the Hydraulic clock. It was mainly made to announce prayer times. Continue After it towards the Henna Souk passing by Fon Douk Smen. After souk Hanna you will reach Zawyat Moulay Driss II (the sultan’s shrine) and across it is is Medrasa el Attarine and few maters is the Kairaouione mosque university. Activities: BouInania, Attarin Medersa, the tanners, Ess-Seffarine Square, MoulayDriss tomb, El-Nejjarine square, and the cabinet makers’ souk, and the Hebrew district ‘Mellah’. After Breakfast, prepare for a drive to Chefchaouen via Ouazzane and through the Rif Mountains which is located in the northern region of the country. When you arrive to chefchouan the first captivating feature will be the blue color all around. Chefchaouen is Morocco’s “Blue Pearl”. It has come to be known as such due to a distinctive blue color all the inhabitant use to paint their houses .This tradition trace back to the Jewish traditions and beliefs that the color blue represents the sky which in turn reminds people of heaven and God. This color covering the city gives it and amazing charm as well as a sense and an atmosphere of relaxation, comfort and peace. Have you heard of healing pearls and gems? Well this one really works. In Road to Ras El Maa you will encounter a group of Granada-styled houses before enjoying tea in the midst of the fresh water. you will visit afterwards Kasbah Ali Ben Rachid and Plaza Uta el-Hammam and a tour around this beautiful city. After your breakfast, travel to tangier the bride of the north. This city is located on the southern passage of the Gibraltar strait, few miles from the Spanish shores. 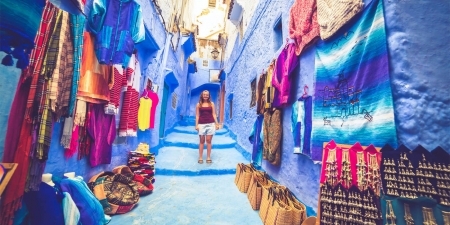 Starting your tour at the Kasbah museum of Mediterranean culture move to the souks and enjoy some of the local product and street food before heading to the American Legation Museum and find between the arts works there the Moroccan Mona Lisa. One of the most interesting places is the St. Andrew Anglican Church with built with a Moroccan style and with the lord’s prayers in Arabic over the altar . Wake up and enjoy a lovely breakfast at your hotel before heading to the airport to catch a flight back home.